A few miles south of Jerusalem lies the City of Bethlehem. Christians around the world know it as the little town where Jesus Christ was born. Still small, Bethlehem has retained a friendly atmosphere and is host to thousands of tourists and pilgrims each year. 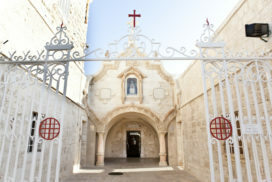 Many sacred Christian sites, Churches and Monasteries are located in the city. 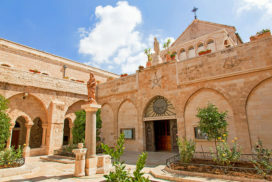 A major attraction is the Church of Nativity at the Manager Square, built over the cave where Jesus Christ was born. The adjoining Church of St. Catherine possesses marvelous wood carvings of the Stations of the Cross. 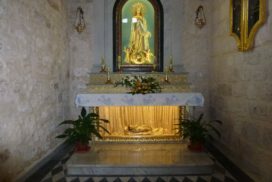 Just a few minutes walk from the Manager Square is the Chapel of the Milk Grotto, where the Holy family took refuge on their way to Egypt and where Mary fed the infant Jesus. This is also where the red rock, which is now darkened by age, turned into chalky white after a drop of Mary’s milk fell to the ground. 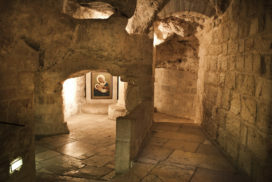 The Milk Grotto is a serene chapel adorned with images of the Madonna and the Child. Along Milk Grotto Street, you can also find handicraft factories that produce lustrous mother-of-pearl and rich olive wood items. 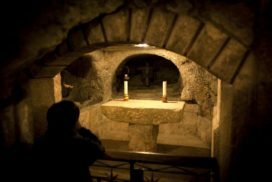 At the northern entrance of the city is the Tomb of Rachel the Matriarch, Jacob’s wife, who died in Bethlehem while giving birth to Benjamin. In the city are remnants of two aqueducts that brought water from Solomon’s Pools to Jerusalem. Visit the Arab Women’s Museum just off Manager Street. In this museum you will find recreated a traditional Palestinian living room (“diwan”) and displays of traditional clothing, jewelry, old photos and personal items from the British Mandate era. You can also visit the Bethlehem Peace Center in Manager Square to learn more about the city and view both the ongoing exhibitions. The Herodion, located in the hills south of Bethlehem, is one of the many spectacular sites worthy of a visitor’s special attention. The view from the top of this strategic fortress built by Herod the Great affords a panorama toward Bethlehem and Jerusalem. Although he died in Jericho, Herod was buried here. Approximately two kilometers west of Bethlehem is Beit Jala, a town set among olive groves and vineyards with stunning stonemasonry and a spectacular view of Jerusalem. The town’s unique location and moderate weather makes it a popular summer destination for visitors in search of clean, peaceful environment and beautiful scenery. In recent years Beit Jala has become well known for its modern hotels and good restaurants, which offer a variety of food to please different tastes. Olive oil is one of the town’s main products. It has a unique taste characteristic of the trees in the area. 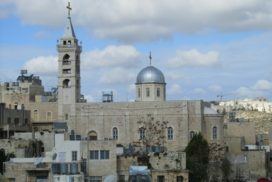 One of the most important sights in Beit Jala is the Orthodox Church of St. Nicholas, established in 1925 and named for the patron saint of Beit Jala, who lived in a cave during his years of pilgrimage in the Holy Land. 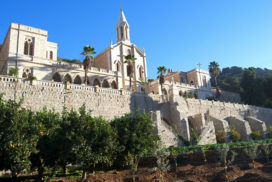 Other sites of interest include the Latin Patriarchate seminary, the Russian-built Church of the Virgin Mary, the Well of the Holy Family and the Cremisan Winery. Beit Sahour is located southeast of Bethlehem. It is the scene of the fields of olives, well-known as Shepherd’s Field, the place where the angel announced to the shepherds the birth of Jesus Christ. There are two points of interest here: a Franciscan Chapel and a Greek Orthodox Church that was built over a cave in the fifth century. There are also some exceptionally old olive trees in the field. While in the town, be sure to ask about the Beit Sahour Municipality Folklore Museum. 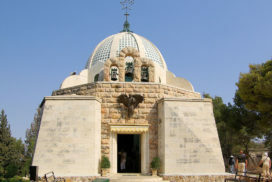 It is located in a fertile valley south of Bethlehem. The name Artas, is derived from the Latin word Hortus meaning Paradise. The ruins include a Crusader convent, the foundations of a Crusader church, an Arab fortress as well as several Roman, Byzantine, Islamic and Crusader ruins. Artas has a breathtaking view of the spectacular Convent of Hortus Conclusus (closed garden) and the surrounding hills and terraced green fields. Hidden among very tall pine trees in a small valley 4-km south of Bethlehem, Solomon’s Pools consist of three huge rectangular reservoirs of stone and masonry that can hold 160.000 cubic meters of water. Although tradition attributes these to King Solomon, the pools almost certainly date from the time of Herod, and may have been conceived by Pontius Pilate. 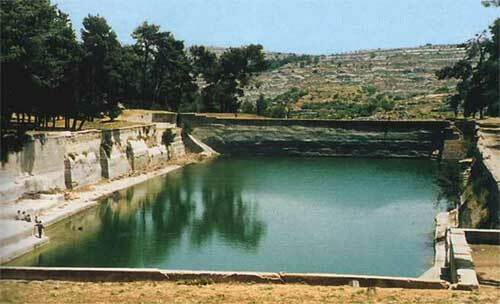 In the past, the reservoirs collected spring and rainwater and pumped it to Bethlehem and Jerusalem. Qalat al-Burak, an Ottoman fortress dating back to the 17th century is located near the pools. The fortress was built to protect Solomon’s Pools water source.